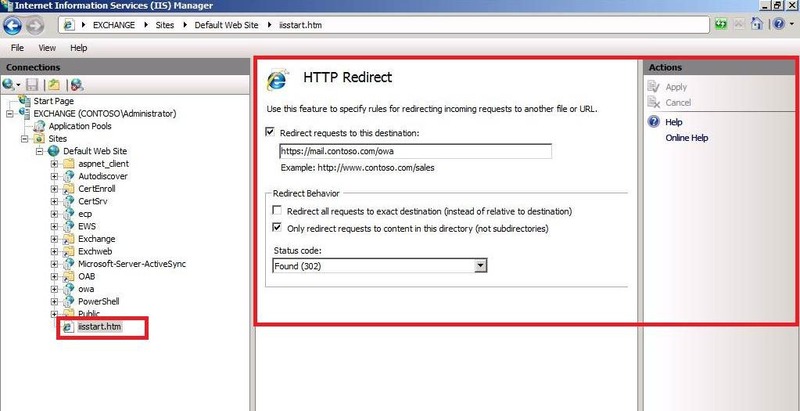 The following covers the correct way to setup an HTTP redirect in IIS 7.5 without setting up the HTTP redirect from the Default Web Site. This is to avoid getting the HTTP redirection getting inherited to all the virtual directories underneath and also to avoid breaking the /exchange to /owa redirection. The proper way to do this is to set the redirection on the iisstart.htm file itself. 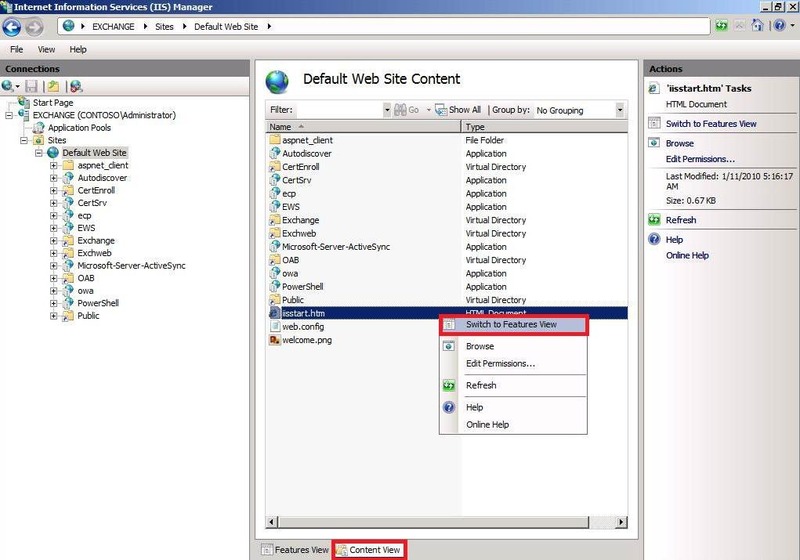 In IIS Manager, highlight the Default Web Site (DWS) and on the center pane, click on contents view. Right click on iisstart.htm and then select Switch to features view. Now on the left hand side, click on iisstart.htm and select HTTP Redirect option in the Features View. Set the redirection as per the requirement. Make sure you select the option ‘Only redirect requests to content in this directory (not subdirectories)’ and apply the changes. Now return back to the Default Web Site and select Default Document in the features view. You should have iisstart.htm listed over here. Select it and move it to the very top of the list as per Screenshot 4. Note: For HTTP to HTTPS redirection to work, remove/disable the SSL from the Default Web Site, this can be done by unchecking ‘Require SSL’ in the SSL settings for the Default Web Site.